Much is required not only of Tom Hardy in director Steven Knight's Locke, but from the audience as well in which I mean it isn't for the the likes of everyone. As someone who is deeply entrenched in the world of movies, where they've been, are currently at and where the trends point them towards going it is always nice to see a film take a certain amount of risk and to see it pay off is even more rewarding. I realize that not everyone will see the merit not only in Hardy's highly nuanced performance, but in what it actually takes to maintain interesting, compelling drama for nearly an hour and a half without resorting to anything more than a man in his car and the world he once knew falling down around him, but Locke illustrates brilliantly how it can take very little to create something of significant impact. There is hardly a minute of this film where Hardy is not on screen and when he's not we are only given brief moments to take in the dimly lit highways of England as Hardy's Ivan Locke makes his way towards London. Even Locke himself is barely able to focus on the road and the world around him because his mind only has the bandwidth to deal with a certain amount of things, granted they are highly emotional items, and in the case of this particular night where we meet him and stay with him in real time he is performing a balancing act of personal and professional tasks that see both of them going nowhere but a place he least expected to end up. It is a bleak film, with a dim color palette and ambiguous atmosphere where all of the information we are able to gather is from our titular character and those he speaks with on the phone. It is not so much what an accomplishment Locke is in terms of pulling off what it did with its restraints, but more that it was able to do so much with them. Within these confinements Knight and Hardy were able to pull off what doesn't feel like a stunt for the sake of attempting something daring but instead have crafted a film that feels as if it is all the better for using the elements it has to build the suspense and create the right kind of mood for which to most honestly convey this story to the audience. It is actually a thing of wonder as I remember being so doubtful of a similar premise four years ago with Buried, but was as almost impressed with how well it was pulled off as I am here, almost. As the film opens we are introduced to a nicely lit cityscape, a line of unfocused lights as Knight pulls in his focus on a flustered Ivan Locke. The car picks up speed and the phone calls begin to be made. We hear the voices of Locke's two enthusiastic sons (Tom Holland and Bill Milner) who are anxiously waiting their father to make it home to watch what is apparently a much-hyped football match while his wife and the boys mother has run to the store to pick up what she needs to make what is clearly one of Ivan's favorite dishes, something he should be there to appreciate, but won't be. We listen in as he dances around his reasoning while then diverting to a co-worker to whom he is more open and honest with about his current situation. He talks with Donal (voice of Andrew Scott) telling him he is going to walk him through what needs to be done to be fully prepared for the morning which is apparently the day one of the biggest deals in his companies history is going to take place. Locke is some type of construction manager and from the sounds of it a very reliable one making this unexpected turn of events all the more surprising not only to Locke himself but those closest to him. After bombarding Donal with a wall of responsibility we are subsequently introduced to other characters who we only come to know through the characteristics that come through in their tones and inflections. One might wonder the full context of these conversations, but it is best to let the circumstances be revealed as you watch the film rather than know everything before seeing the film. It is a movie that thrives on the unraveling nerve of how our protagonist will deal with the different aspects of the situation he finds himself in and how he may or may not be able to keep it together. 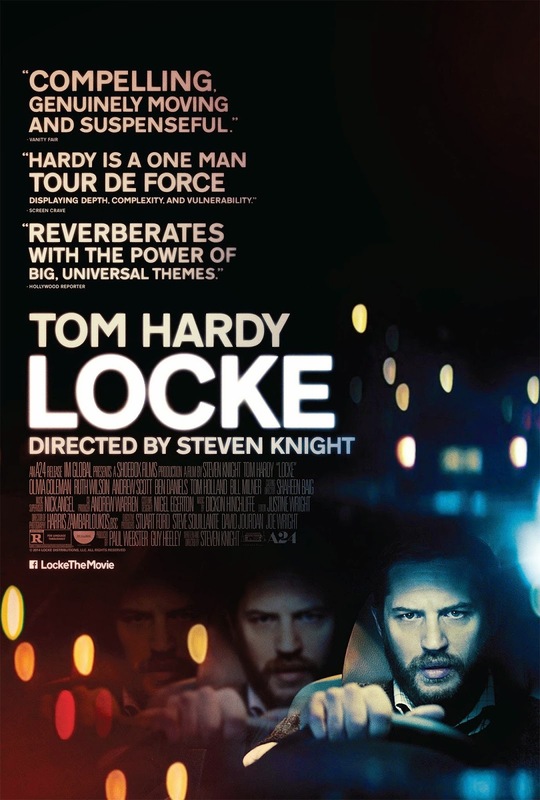 That Hardy is the only actual person we ever see on screen naturally places the success of how well this kind of story and film are pulled off and it is greatly to his credit, along with Knight's strict screenplay, that Locke turns out to be as riveting as it is. 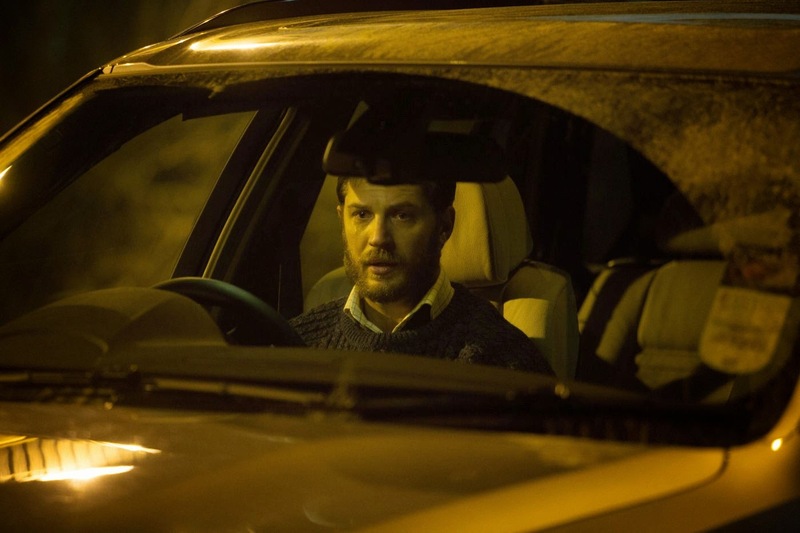 Tom Hardy is Ivan Locke who's on a one-way street to uncertainty in Locke. It is in the screenplay that director Knight makes his greatest artistic contributions as he can only do so much with the camera and editing given the set-up, but that he found as capable an actor as Hardy allows this to be enough. In reality, this would make just as entertaining a stage or even radio play as it is all about the dialogue and how it is delivered and this is where Hardy prevails. It becomes more and more apparent through the course of the story that Locke is a responsible, reliable and generally upstanding member of society. In short, he is the last person his friends and family might expect to be caught up in questionable circumstances, but as he is and as he addresses these conflicts with each individual in his life he becomes the different person he is to them in their life. As he speaks with Donal and his boss Gareth (voice of Ben Daniels) he is very matter-of-fact and very calculated with his heavy Welsh accent. When it comes to speaking with his wife Katrina (voice of Ruth Wilson) and their sons we hear the more guarded and adamant elements of his tone fade away and become more of a hopeful ignorance where Locke imagines a world where things were as they might have been if he didn't become the disappointment to them that his father was to him. We only see Locke refer to his father a few times, but it is the one aspect of the film that feels more trite than intrinsic to the writing and story elements. It is when Locke is forced to address Bethan (voice of Olivia Colman) that the variances in his personality are forced to meld together. This is a difficult state of being, a balancing act where he wants to appear sympathetic while inviting in a level of distance that makes it clear to the woman on the other end of the phone what the state of their dynamic is. It is again difficult to address and discuss in depth the situation without going into greater detail, but it is by virtue of how well Hardy brings the character to the forefront of our concerns that we are anxious every time he answers a call; waiting to see what situation he will have to deal with next. Needless to say, I was kind of blown away by this film and its ability to keep me not only invested but on the edge of my seat. I enjoyed the insight to which Knight looks at the individual and analyzes their psyche when they are placed in a difficult situation specific enough to them, but broad enough that general audiences can relate to everything that is happening giving them as equal a voice in the anticipation of what the outcome might be as the character himself. There is an element in the bits where Locke addresses his father that bring out a truth to us all about how we act when we're in a vehicle by ourselves with no one to talk to, no one to call and the radio off. There is an element of expressing feeling out loud that is invaluable, that takes the weight of certain issues off ones back. While I call that part of the script the most unimaginative it does relate to the audience the contradiction that while Locke seems to be taking full responsibility for his actions when speaking to actual people, in his private time he needs some relief from his faults and mistakes. There is a human understanding in needing to take out your anger on someone else, I just wish Knight would have found a more convincing less hackneyed way of doing so. At the end of the day though, this is a film that re-enforces the vitality of its minimalism by bringing these large-scale themes and universal ideas together and boiling them down into a single night within a single man. It gets to the core of how big we make our worlds yet how small we are in the physical realm of everything going on around us and how quickly our lives can change. To the soul of a cinephile the capability to transfer these ideas so effortlessly is nothing short of impressive. It is the ultimate trick of being able to show rather than tell while using only the language and single performance of a capable actor to do so. It is a movie I was taken by from its earliest moments on screen yet I can easily understand why those around me who are less infatuated with film may not see the value in it. That being said, I will be very surprised if I don't count this among the best of the year come December.